The most common misconception patients often have, is confusing having involuted toe nails with ingrowing toe nails. The major difference being, in-growing toe nails actually penetrate the flesh, whereas involuted toe nails may cause pain or discomfort but does not cause penetrate the skin at all. Often times, conservative nail cutting can alleviate your problem and there is no need to carry out nail surgery, however this can usually only be determined on an individual basis after assessing and often times through trial and error. Nail surgery as with any surgery should generally be a last resort to conservative treatment. Although the term ‘surgery’, might sound quite drastic, in this case it actually isn’t all that drastic at all. 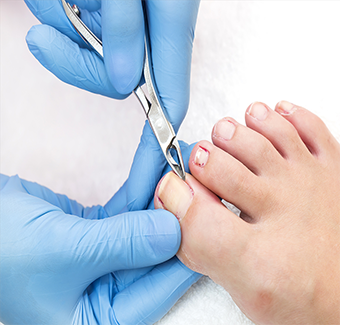 The procedure itself takes around 1 hour which includes signing consent forms, applying local anaesthetic, removing part of the nail/entire nail, applying a chemical to prevent regrowth (in some cases) and dressing the toe. As with visiting a dentist, the only uncomfortable part of the procedure is the application of local anaesthetic, which takes seconds. After that, it’s all plain sailing from there. Risk of Infection – Remedied with antibiotics. Prevented with healthy/effective after care. Risk of Regrowth – 3% chance that problematic area may regrow. Risk of phenol burn – Phenol is the chemical used to prevent the problematic area of nail from re-growing. Being a caustic, this may irritate the skin, post-surgery. However this is remedied through the body’s natural healing process. Is likely to heel well, post-surgery – poor circulation and poorly controlled diabetics are some examples of patient’s we would generally avoid carrying out nail surgery on. Can manage to look after themselves post-surgery. If not, we try to assess if a patient has the right help at home. A lot of patients are concerned that they will have to take several days off work after their nail surgery procedure. The good news is, this is not true. Whilst healing time is around the 6-week mark (you will be easily able to walk around and live out your daily routines 1 day after your procedure. Your initial dressing will be chunky and may require you to wear alternative footwear, however once this has been changed, your dressing will be much smaller and you can fit into your usual footwear in most cases. For more information or if you are concerned that you may require nail surgery, please feel free to contact us.